A few weeks ago, Simrit, a dear friend from LA, came to visit and gifted me with a tin of No Chewing Allowed Original French Truffles. The chocolates weren’t from LA, but knowing me so well, while gallivanting around the city, she picked up the chocolates figuring I would like them. She was partly right, because not only do I like them, I seriously love them. According to their website, the chocolates follow a French family recipe since 1934. Whatever the pedigree, these chocolates are easily likeable. 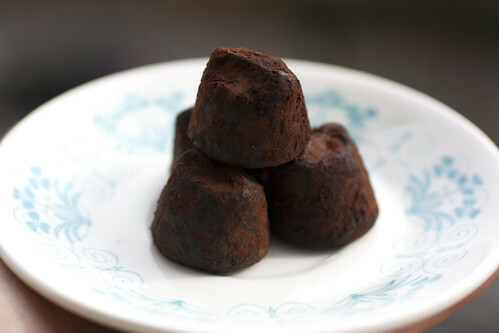 The truffles are sweet, not too dark, with a fine dusting of bittersweet cocoa to counter the sweetness. The best part, however, is the smooth meltability. The creamy truffles start melting in your mouth immediately upon contact. No chewing is necessary, but I find it too hard resist. 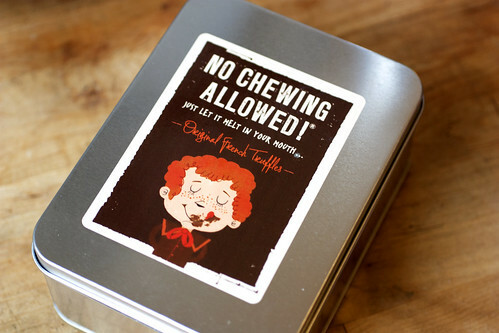 Chewing may not be allowed, but rules are meant to be broken, especially delicious ones. How many licks does it take to get to the center of an Original French Truffle? The world may never know. This particular tin (27 truffles for $18.99) was purchased at The Holiday Market At Union Square, but can also be found at a few other pop-ups as well as on their website. They’re also at Columbus Circle this year — and yes, so sick. Son unas trufas exquisitas, se te deshacen en la boca, solo tienes que dejarte llevar por tù paladar,y te sentiras que tienes en la boca una cremosa e indescriptinle sensaciòn de un maravilloso sabor a chocolate totalmente diferente. Ha sido una experiencia totalmente exquisita para mì, y la verdad he probado muchos chocolates en mì vida, pues soy amante a estos, Simplemente exquisitos y el chocolate caliente tambien!!! !